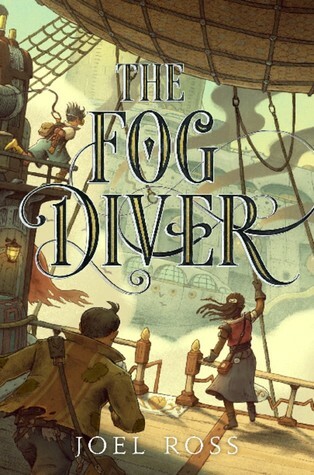 Joel Ross makes a triumphant middle grade debut with The Fog Diver – a swashbuckling, science fiction-fantasy that conjures comparisons to Kenneth Oppel’s Airborn and Jenn Reese’s Above World. In other words: READ THIS BOOK NOW. Why did I read this book: The premise! A ragtag group of orphans piloting an airship, salvaging relics from a Fog-shrouded world? Yes PLEASE. It has been many decades since the world has been enshrouded in Fog – the entire Earth, covered by a substance that means certain death for humans, and has forced survivors to the highest peaks that protrude above the line of deadly mist. Now, people cling to these peaks and live under the tyrannical rule of Lord Kodoc, who controls not only the rich upper echelons and the Five Families, but also the junkyards and all of the orphans and slum bosses who thrive on the lower levels. Chess is one such orphan and slum-dweller – not that he minds the slums particularly much since he lives with his closest friends, who have become his new family. There’s Hazel, the eldest and wisest of the group, who also serves as the unshakable captain of the crew’s junk salvage raft. There’s the burly and brutish Sweedish, who serves as the salvagers’ muscle and ace pilot. There’s sweet, brilliant Bea, who can talk with ship engines and understands machinery intuitively. And, finally, there’s the protective presence of Mrs. E – the heroic woman who found all of these orphans, saved them from terrible, lonely fates, and watches them under her roof. For Chess, Mrs. E is not only his savior, but his protector – she rescued him from his cage in the fog, and keeps his identity secret, especially from Lord Kodoc. You see, Chess is no ordinary thirteen-year-old boy: he’s the best tetherboy the world has ever seen, thanks to his unique birth and the Fog that clouds his eye, and thus is immune to the Fog sickness that eventually destroys any human exposed to its mists. The one successful product of Kodoc’s experimentation in the Fog, Chess is a child who was born in a cage, on a leash, beneath the line of mist that separates the surface world from the safety above. Should Lord Kodoc learn that Chess is immune to the Fog, all hope for Chess’s future will be lost – he will become a slave, a tool for Kodoc’s mania, scouring the dangerous grounds below for a fabled machine that can reverse the damage done by the nanobots in the Fog. When Mrs. E falls ill with Fog sickness, Chess and his friends will take any risk to save her life – even if that means Chess’s greatest secret and deepest fear may be exposed. I’m going to formally start this review by stating outright that The Fog Diver is a freaking AWESOME book. Joel Ross makes a triumphant middle grade debut with The Fog Diver – a swashbuckling, science fiction-fantasy that conjures comparisons to Kenneth Oppel’s Airborn and Jenn Reese’s Above World. In other words: READ THIS BOOK NOW. “Constellations,” Hazel said with a soft laugh. Gazing at the stars, I almost told them the old tale of “Skywalker Trek,” about a space war between the Klingons and the Jedi, set in a future when people lived on distant planets, and fought Tribbles, Ewoks, and Borgs. I decided to stick with constellations, though, because sometimes my stories got a little garbled. The Fog Diver is not the book I was expecting it to be – the passage above, from very early in the story, I think embodies a little bit of that unexpected humor and classification. See, from the book description, I had thought this was a fantasy novel of the steampunk aesthetic – after all, there are grand airships floating around, complete with air pirates, and a society of humans that lives amongst the highest mountaintops. Imagine my surprise, then, when I learned that The Fog Diver is actually a science fiction-fantasy novel and a post-apocalyptic yarn set in a far-future version of our own world! The Fog? That’s not some magical mist born of evil sorcery – it’s actually a byproduct of humanity’s hubris. Scientists created nanotechnology to repair seemingly irreparable damage to the worldwide environment, but the bots did their job too well. Learning that humans are the ultimate source for the destruction of the fragile ecosystem, the technology started to target people, evolving into the blanket mist that allows flora and fauna to blossom, but violently expels any human interlopers. She never panicked. When I got scared, my mind blanked and I froze. Not Hazel. Instead, she accepted every new problem and immediately calculated the best response […] I’d dived into uncharted Fog for three years and seen things nobody else had even imagined, but I’d never seen anything like Hazel. The other thing I loved so very much about The Fog Diver is the writing. Not only is the book a legitimate swashbuckling page-turner, it has the added bonus of being heartwarming and hilarious. Joel Ross imbues this book with a delightful sense of absurdity through young Chess’s narrative as he tells his friends the stories his father had collected for him in a scrapbook of the world Before the Fog. This world is a jumble of pop culture touchstones (Skywalker Trek, Hello Kitties) and real science (nanotechnology, engineering). More than that, it asks the deeper question that I think lies at the heart of any post-apocalyptic dystopia worth its salt: what happens to all of the knowledge and culture we humans have amassed over the millennia? Who remembers, and how do we remember things, when everything is gone? Chess honors this tradition in the best way he knows how – through scraps and findings and oral tradition – and I loved every minute of it. The Fog Diver reads like a standalone novel, filled with hope and adventure – I only hope there’s more in this world to come. Absolutely recommended, and on my notable reads list of 2015. My name is Chess, and I was born inside a cage. Imagine a wooden platform jutting from a mountain cliff. Now picture a chain falling from that platform and vanishing into the Fog, a deadly white mist that covers the entire Earth. That’s where I was born: locked in a cage, at the end of a chain, inside the fog. And I would have died there, too, if Mrs. E hadn’t save me. When she saw my face for the first time, wisps of Fog swirled inside my right eye, shimmering white shapes that marked me as a freak. That’s why I’ve spent thirteen years keeping my head down, staying quiet and afraid–but now Mrs. E needs help, now she needs saving. It’s time to stop hiding. Everything is going to change.